In spite of its key role in creating the ruinous financial crisis of 2008, the American banking industry has grown bigger, more profitable, and more resistant to regulation than ever. Anchored by six megabanks whose assets amount to more than 60 percent of the country’s gross domestic product, this oligarchy proved it could first hold the global economy hostage and then use its political muscle to fight off meaningful reform. 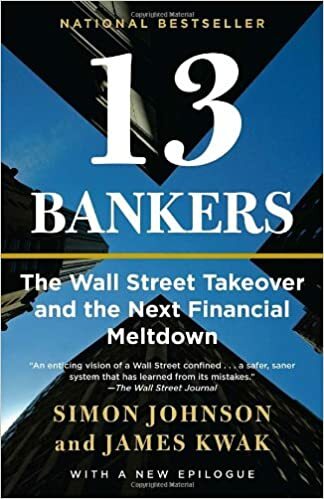 13 Bankers brilliantly charts the rise to power of the financial sector and forcefully argues that we must break up the big banks if we want to avoid future financial catastrophes. Updated, with new analysis of the government’s recent attempt to reform the banking industry, this is a timely and expert account of our troubled political economy.